Daybreak began worship on World Communion Sunday in 2014. 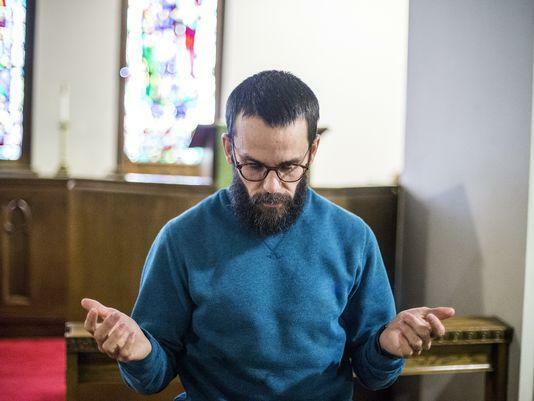 It was no accident that Ben Floyd led the first service of a new congregation in Asheville, NC that centered in recovery with Communion. For many of us recovery groups like AA or NA or overeaters anonymous or grief groups are unknown. We have not attended but maybe we have a friend that does, a coworker that is sober through working the 12 steps; we believe in the value of recovery, but it is not for us. Others of us attend meetings weekly sometimes nightly. We work the steps because the steps give us life and hope. Recovery is central to who we are and how we know God. Ben helped me to see that recovery is for everyone. In some way we are all in recovery. We have all lost or been broken, many of us have issues with addiction or co-dependency, many of us deal with grief on a daily basis; working the 12 steps is a beautiful way for all who are broken to find healing and wholeness. Ben began Daybreak while also beginning a Masters of Divinity degree at Candler. When one writes those words on a paper it sounds kind of crazy, but Ben took it in stride, making excellent grades and leading a new forming congregation with grace and confidence. However, the driving and being away from his family was taking a toll. Starting a new congregation is hard enough but doing it while going to school in another city is too much for anyone. Ben and his family made the decision to move to Atlanta to finish school. What would happen to Daybreak? While on study leave at Duke, Blue Ridge District Superintendent John Boggs was talking about Daybreak to a group of pastors and the possibility that it may cease to exist. Sonny Reavis overheard this conversation and expressed interest in helping lead the continuation of Daybreak. Sonny had experience with recovery ministry and believes in its importance. Currently, the original Daybreak leadership team is meeting with new members from Biltmore UMC and Daybreak will re-launch just after the first of the year. Ben Floyd’s leadership helped jumpstart recovery ministry in Asheville, and now Sonny continues the charge. Communion was so important for our first Daybreak meeting because Communion connects us across time and space. When we partake in Communion we do so with everyone who has come before us and everyone who will partake after us. Daybreak may need to reinvent, move is a little different direction, it even has new leadership, but the Communion that we are a part of keeps going and calling us. May we respond to that call so that all creation may know the healing and wholeness of God. Luke Lingle is an Ordained Elder in the WNCC currently serving as one of the conference’s Congregational Vitality Strategists. Biltmore UMC was one of three recipients of the Justice and Reconciliation Team’s “Lazarus Award” for its efforts to relaunch Daybreak.